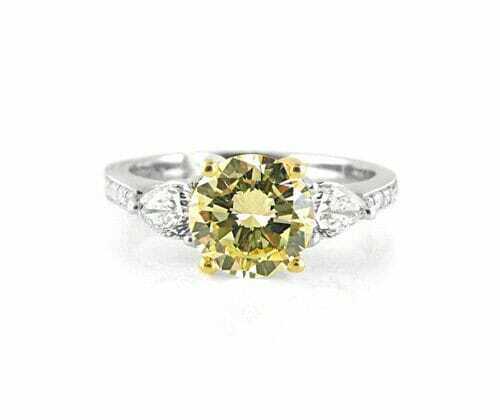 This Platinum and Yellow gold ring heralds a round Brilliant cut centre diamond (Centre Diamond: 1.19ct, VVS2, Light fancy yellow,with EGL certificate) set between two Pear cut diamonds (Two side diamonds:= 0.42ct, FG, SI) with small round diamonds (Small diamonds: =0.15ct, GH, VS-SI) on the band. Handmade by our master goldsmiths on our premises with the highest grade Platinum and Yellow gold. Also available in White Gold, Rose Gold or Yellow Gold. Can accommodate a variety of diamond sizes with various colours and clarity. GIA Certified diamonds also available. Available by special order* *Extra fees may apply.